WHILE the feint of heart, the PC deluded and general naysayers will scoff at such a thing as cannibalism in today’s “civilized” day and age, well, this blogger has news for them: “it be” true! NOT only that, but Islamists have received a “halal” ( حلال‎ ) seal of approval. You may ask: what the hell is that? Well, it is their “kosherized” form of the “Good Housekeeping Seal of Approval.” Yummy. But, in order to get to the real down and dirty, one must be willing to take the time to dig beneath the ROOT(s) of jihadi sacrificial slaughter:Islamic Cannibalism ROOTED In Islam’s Relationship To Blood -The Slaughter of Christians & Jews! Moreover, the relationship between Islam and blood is inextricable, and it must be internalized for what it is. 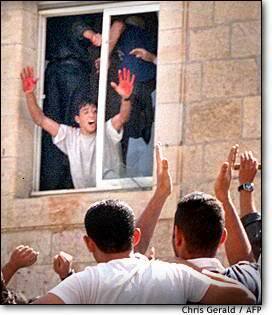 A “proud” Arab-Muslim “hero”, Aziz Salha, his hands covered in the blood of the Israelis, waves in a bragging manner through the window to the larger crowd anxiously waiting in the public square. And, if cannibalism doesn’t suit some of their taste buds, another “delight” is similarly Shariah Law sanctioned. Enter…beheading:Egypt’s & Syria’s Civil Wars – Brotherhood/Salafists/Al Qaeda In The Forefront – Christians Beheaded: The Cancer Of Islam! Straight from America’s campuses, specifically, San Francisco State University (SFSU), a “Palestinian” jihadi student strutted his stuff. But never mind, aside from an outraged Jewish community, main players were non-pulsed:ADDITIONAL TERRORIST THREATS/INCITEMENT FROM SFSU “PALESTINIAN” STUDENT UNION LEADER (Muhammad G. Hammad): EXHORTING TO DECAPITATE ISRAEL SUPPORTERS ON SOCIAL MEDIA; SCHOOL, AG AWOL. The question becomes: what will it take to awaken the (mostly) slumbering west from its deer-in-the-headlights inaction? Yet, if many Eurabians are feeling safe and smug – not so fast:London’s Islamic-Inspired/Sanctioned Head Chopping; Cameron’s Hideous Response; And Boston’s Jihad, Cause & Effect. ONTO…the merging of Islamic cannibalism to the techno era! Editor’s Note: EXTREME CAUTION ADVISED: The videos linked and embedded at the end of the story are extremely graphic, showing brutal executions. Newly released videos show Muslims conducting “ritual human sacrifices” by slitting the throats of their victims or putting a bullet in their heads, according to researcher Walid Shoebat, a former member of the Palestine Liberation Organization who converted to Christianity. Shoebat’s report includes several videos of ritual sacrifices. He noted the speaker in one video uses the term Qurban just before gunfire erupts and men lined up in a row fall to the floor one by one. Shoebat explained that the Arabic term “can only signify a sacrifice, which indicates that the filmed slaughter is nothing but a ritual human sacrifice.” Another video shows the throat of the “sacrifice” being slit with a knife. “Christians are being killed in these very rituals every day, and the bloodshed will not stop. We must work together to rescue them,” Shoebat said. Shoebat describes himself as a former “radicalized Muslim willing to die for the cause of jihad.” According to his biography, he arrived in the United States in 1978 to study in Chicago where he was recruited at a “terror conference” by Jamal Said, the founder of the Islamic Association of Palestine, a front group for Hamas that later launched the Washington, D.C.-based Council on American-Islamic Relations. Shoebat said he converted to Christianity in 1994. He now is raising funds to assist Middle East Christians through a foundation he created called RescueChristians.org. WND recently reported that Sister Dogan claimed members of the jihadist factions in Syria trying to oust President Bashar al-Assad are draining the blood of Christians they behead and selling vials to Islamic radicals for $100,000 apiece. The Christians, she said, are beheaded in ceremonies in which they are forced to kneel, with their hands and feet bound as the Muslim radicals read a death sentence imposed because the victim refuses to renounce Christianity and embrace Islam. The alternative offered was death. The videos discovered by Shoebat are graphic. Editor’s Note: EXTREME CAUTION ADVISED.The following videos show brutal executions. Shoebat said the Islamic prayer in the video “is reminiscent to the prayer said in the sacrifice scene in the film ‘Apocalypto,’ which is historically accurate in regards to its depictions of the bloody Aztec rituals.” “What Islam is is an Aztec-like religion of the pagan world, riddled with human sacrifice, cannibalism, and a pool of human gore,” he said. A video posted on YouTube shows Hatune presenting the results of an investigation in which she found women held captive by Muslims for ransom had been raped and mutilated. She also presents evidence for her claim Muslims are beheading Christians and selling their blood. Previously, Shoebat published a video of Sunni Muslims playing soccer with the heads of the people they murdered. WND Middle East correspondent Michael Maloof, a former senior security policy analyst in the office of the secretary of defense, said the “vociferous wrath” from jihadists that Hatune is receiving because of her vigorous effort to protect Christians has made her a prime target of al-Qaida and its affiliate, the Jabhat al-Nusra. Some 11,000,000 Muslims have been violently killed since 1948, of which 35,000, or 0.3 percent, died during the sixty years of fighting Israel, or just 1 out of every 315 Muslim fatalities. In contrast, over 90 percent of the 11 million who perished were killed by fellow Muslims. Calling For An Islamic Reformation Via Strong American Leadership & Cold War Messaging. The Confrontation: Winning the War Against Future Jihad! While this site has its own recipes for confrontation, the above is more than worthwhile to consider, at least as a starting point. Nevertheless, sitting still is NOT an option. Most significantly, electing western leaders who are incapable of separating themselves from their linkage – to the very same sources/ideology of terror – is no longer viable. Untenable. This entry was posted in Uncategorized and tagged "halal", 'Islam and Blood', Arab-Muslim "hero" Aziz Salha his hands covered in the blood of the Israelis, Christians Beheaded, Islamic Cannibalism, London’s Islamic-Inspired/Sanctioned Head Chopping, MUSLIMS CONDUCT 'HUMAN SACRIFICE' ON VIDEO, SFSU “PALESTINIAN” STUDENT UNION LEADER (Muhammad G. Hammad): EXHORTING TO DECAPITATE ISRAEL SUPPORTERS by Adina Kutnicki. Bookmark the permalink. There was a time when I was young that I could not have believed that human beings could act in ways that the present-day mooslims do. The Aztecs got nothin’ on ’em, baby! When a sodomite couple in Oregon demand that a Christian make a “wedding” cake for them and are refused, the media and NoBama go nuts. When a few thousand Christians who have lived in Syria for almost 2,000 years are beheaded and disemboweled, there is complete silence. Still recall when Israeli troops got the mooslims out of the Church of the Nativity in Bethlehem. Too bad it was after the mooslims had shat all over the Church. Not the fault of the brave Israeils – they could not have known that the mooslims would behave like loose-bowels animals.